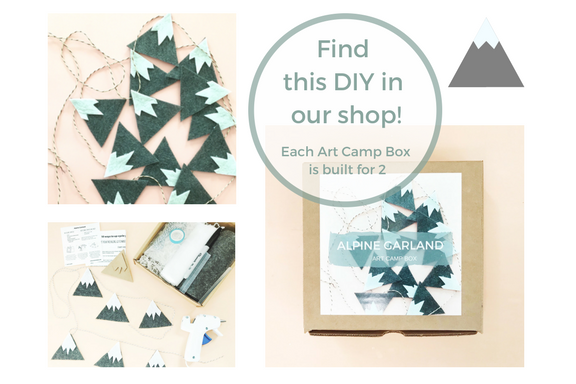 Buy the Alpine Garland ART CAMP BOX here. 1. Pick the felt color that you would like to use for your mountains (we chose charcoal grey). 2. Cut templates for the mountains and snow. 3. Trace your templates onto the felt with a Sharpie marker. 4. Cut out everything that you have traced, eliminating the Sharpie lines. 5. Attach the snow pieces to the mountain pieces using a hot glue gun. 6. Glue the snow-capped mountains to your thread with a dab of hot glue. 7. Hang your garland in a cozy corner and enjoy the view!